If you plan to become a beekeeper, you definitely need at least one good bee hive. To save you some time we have done the research on some of the best bee hive models for sale and compiled the most highly acclaimed products together with their main features. Taking into consideration customers’ experiences and opinions we recommend you the Mann Lake 10-Frame. This assembled kit is made in the USA and is build out of painted pine. It contains a 10 frame beehive body that is 9 and 5/8 inches in dimensions and ten 9 and 1/8 inch frames that have a waxed foundation. The product features a solid painted bottom board with an unpainted entrance reducer. The product weighs 31.6 lbs, has a solid construction, and it’s well packaged. If you are not able to find this exact model on the market, we also recommend the Mann Lake Starter Kit. The product is made from quality American pine wood and comes already assembled inside the package, ready to receive bees. The kit contains a painted solid bottom board, an entrance reducer and a telescopic cover that is also painted. This product provides the easiest and quickest way to get a beehive. It’s a great product for beginners, but also for experienced beekeepers. The paint job is poor on this beehive, especially on the bottom. After a year it is known to rot. If you are searching for a quick start in your new found passion, this product is a great choice. 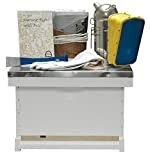 Besides the beehive box and the ten frames, this kit includes protection equipment such as a bee veil, a pair of thin leather gloves, a hive tool and a smoker that features a guard. Moreover, the kit comes with a book called “Starting with bees”. The kit comes completely assembled and painted. Therefore, all you need are the bees and you’re ready to begin working. Although it comes with a bee veil, it does not come with the helmet that the veil attaches to. This product gives any beginner the perfect start as it contains everything he/she needs at first. The product is made from good quality pine and both the beehive box as well as the 10 wooden frames come completely pre-assembled, ready to receive the bees. The wood frames feature a foundation made of yellow wax. In addition, you get an entrance reducer and an inner and top cover. The hive can hold up to 30,000 bees depending on the weather conditions. The wood exterior is poorly assembled. After a few months the corner joints warp and separate. This good kit comes with everything you need to start your first beehive. Consider buying multiple units. Whether you are an experienced beekeeper or only a beginner looking to acquire your first honey bee hive box, there are a lot of options at your disposal. By analyzing bee hive reviews and customer opinions regarding bee hive boxes for sale, we made a list containing some of the best products. This kit is built out of pine wood and comes pre-assembled, ready to be put to use without any delays. The product includes a hive body that can accommodate 10 frames measuring 9 and ⅝ inches and 10 wooden frames that measure 9 and ⅛ inches. These frames feature a RiteCell yellow waxed foundation. The bottom of this hive box is made out of one solid board that has been painted for better protection. Moreover, the product features an unpainted entrance reducer plus a telescoping cover. This last mentioned component is also painted. The assembled product has a length of 22 inches, a width of 18 and ½ inches and a height of 13 and 1/7 inches. All you have to do is to set it in an open space near a fresh source of water and food and you are pretty much done. The kit comes pre-assembled, so you don’t have to spend time reading manuals to figure out how to assemble the product. The box is well constructed and the joints are sturdy. This product will resist rough handling and won’t break if it’s accidentally dropped on the ground. It takes a short amount of time to set the beehive. The whole mounting process takes less than 10 minutes. This kit offers beginners the fastest way to set up a hive. This type of hive is easily expandable. All you have to do is to add more boxes on top and be prepared to manage more bees. The paint job done on the bottom of this beehive is of poor quality. Customers claim that after a year of use, the bottom board has rotted. For what you get, this product is relatively expensive. You can find cheap bee hive boxes in other places there are similar in quality. This product comes completely assembled and contains everything you need in order to start working with bees. You receive a painted ten frame hive body that measures 9 and ⅝ inches made out of pine and 10 frames that have a foundation made out of wax. This is an advantage as many bees prefer a wax foundation instead of a plastic foundation in their hive. Besides the usual beehive components found in most kits, the Starter Kit also contains some protective equipment so that the chance of you getting stung is lowered and your confidence is boosted. The kit contains a pair of leather gloves, a smoker with a guard, a bee veil, a hive tool for regular inspection and a book called “Starting Right with Bees”. Take into consideration that you do not have the cap to which the bee veil attaches so you will have to purchase that item separately. You receive protective gear and accessories under the form of gloves, a bee veil, a hive tool, and a smoker. These will help you operate the hive and inspect it properly. The kit contains the “Starting Right with Bees” book. This is a great source of information especially for beginners or for people having trouble searching information online. The hive is pre-assembled and ready to go just as you receive it. You don’t have to build it yourself; all you need are the bees. The kit’s design greatly favors beginners. They will not have any trouble in setting this hive into its place and starting collecting honey. The cap assigned to the bee veil does not come with the veil itself. Therefore, you have to buy this item separately. Some customers received a hive of questionable quality that was either damaged or had missing parts. This product is entirely manufactured in the USA from pine wood. Like most kits, this model includes the hive body capable of holding 10 frames. The box measures 9 and ⅝ inches. In addition, the product also comes with these 10 frames each measuring 9 and ⅛ inches. The frames are pre-assembled and feature a foundation made of wax so that the bees will feel comfortable building the hive on it. On the bottom, you can find a solid board that features an unpainted entrance reducer. In addition, the box has a telescoping cover. Your apiary will be complete by acquiring this kit. It doesn’t take long to install and as most of its components are pre-assembled you don’t have much work to do. This kit accepts standard size frames, therefore you can buy the frames separately as long as they have the standard dimensions. You may also purchase other hive parts from the Mann Lakes website. The components are built so that they comply with the standard sizes. This allows you to later buy other hive parts and replace them. The hive comes pre-assembled. Therefore, you only have to choose an appropriate spot and place it without having to construct it yourself. The bottom boards feature a yellow wax foundation which is better than other models that are fitted with plastic foundations. Depending on the weather a hive can hold up to 30,000 bees which leads to producing a large quantity of honey in a relatively short amount of time. None of this kit’s wooden parts is painted, therefore it will not last long in the outdoors. To better resist rain and moisture you have to paint it yourself. After a while, the front entrance reducer does not fit anymore, especially if the exterior is left unpainted and the panels modify their shape. This Mann Lake Kit is made from pine wood and comes pre-assembled ready to receive the bee colony. For added durability and long product life, the exterior of the beehive is painted with a shade of natural gray. Moreover, each box is stapled so that its durability is increased. The complete kit has a length of 19 and ⅞ inches, a width of 16 and ¼ inches and is 9 and ⅝ inches tall. The hive body is 9 and ⅝ inches and can accommodate 10 frames. These frames are included in the package and feature a waxed Rite-Cell foundation. They measure 9 and ⅛ inches. This kit offers you the perfect solution if you are a beginner or an expert who needs a hive set quickly. The hive is already painted, assembled and treated. It is a simple design that works and gets the job done fast. The product comes already assembled. Therefore, it doesn’t take long to set it up in an open area and introduce the bees. The design of this kit is simple and contains everything you need to get your beehive going, including all the frames. Unlike many other beehive kit models this one has its exterior already painted, therefore it will last longer under bad weather conditions. This product is easy to use even by beginners. All they need to do is to place the hive, bring the bees and they can learn the craft gradually after the hive is already in place. Although the build is sturdy, some pieces are not cut with enough attention to details and thus, small gaps can be observed along the front and back sides. Some customers have reported that the product has small indentations in the wood on the interior surfaces of the hive box. This product contains top and bottom frames that have no holes in them. This pack contains 200 end bars, 100 top bars, and 100 bottom bars. This means that in the end, you will obtain 100 frames. They are made after standard dimensions so they fit through any uncappers. These unassembled bee hive boxes measure 9 and ⅛ inches and they need to be paired with beehive boxes that measure 9 and ⅝ inches and 8 and ½-inch foundations. The end, top, and bottom bars are made out of high-quality pine wood and are grooved to facilitate an easy assembly. The pieces are cut and milled with high precision. The bottom bar is 30% thicker. This kit does not include nails, so in order to assemble the frames, you will have to buy them separately. The components don’t have to be beaten to interlock and at the same time, they fit together well enough not to slide out of their grooves. The components that arrive in this package are very well built, the cuts in the boards are precise and the pine wood is of good quality. Many people used to build their own frames from scratch to save money but acquiring this product is a better choice as the cost is low and you save yourself a lot of time. As opposed to other pre-assembled frames that come in kits, you have the option of assembling these ones using both nails and glue. This makes them last for years. The side rails are tapered so that the whole process of assembly is a lot easier. The end, top and bottom bars don’t come preassembled, so you have to build them yourself and make each frame individually. The frames don’t have holes, so you won’t be able to make a wax foundation with wire support running through it. This Mann Lake Kit contains two pre-assembled beehive boxes each measuring 6 and ⅝ inches. Both boxes are completely painted to give them durability in bad weather conditions such as rain or snow. The kit also contains twenty 6 and ¼ inch frames that are already assembled. Both the beehive box as well as the frames are made out of quality pine wood. The foundations are coated with yellow wax from RiteCell. In addition, the hive boxes also contain an entrance reducer that is not painted and a telescopic cover. The frames feature handles cut into each of their sides so that the hive boxes can be easily maneuvered. In addition, the lid is covered with a metal sheet that further expands its durability. 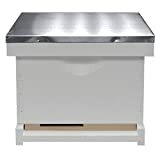 Because this product comes with two beehive boxes and 20 frames it is extremely useful for beekeepers who own a lot of bees or need a quick expansion. The kit comes with two beehive boxes and therefore offers you the possibility of managing a larger bee colony or the possibility of expanding your existing one. The beehive boxes are well protected from the weather. The boxes’ exterior is painted and the lid is covered by a metal sheet. Each side of the frames features a handle cut into it for easy transportation and maneuvering when inspecting the bees. According to customers, the product lasts long years without having any problems. The quality of the materials together with the protection measures give this item durability. The entrance reducer is not painted so that component is prone to rot and eventually may change its shape so much that it will not smoothly slide in and out. During shipping, the top part of the beehive box may suffer damage. Customers claimed they have had to repair that portion. This kit contains a beehive box that comes completely assembled. For added durability and structural strength, the honey super is stapled. You can fit inside the 6 and ⅝-inch beehive box 10 frames that measure 6 and ¼ inches. The frames are included and are pre-assembled. Both the honey super as well as the frames are made of quality pine wood. The plastic foundation is coated in yellow Ritecell beeswax so the bees can comfortably start building the combs. The whole product measures 19 and ⅞ inches in length, 16 and 1/4 inches in width and 6 and ⅝ inches in height. The product is painted on the exterior surfaces and features cut-in handles on all sides. The handles are extremely useful for when you have to inspect the hive or to begin extracting the honey. The exterior panels of the beehive box are well fitted in the corners as the cuts are precisely made. The honey super is stapled for added structural strength. This improves the product’s durability as it’s transported or handled during hive inspections. There are four handles on each side of the beehive box. This greatly aids the beekeeper in handling the hive box. In consequence, this keeps the bees safe. The exterior of the hive is painted in a white color that matches any outdoor environment and protects the pine wood from water and moisture. Everything comes already assembled. This is great news for beginner beekeepers who only have to take the unit to its designated spot and introduce the bees to it. As the foundations are made of plastic and only covered in beeswax, some bees might not draw comb on it as easily. In some isolated cases, people received the kit with some missing or damaged components. This kit contains a durable stapled honey super that measures 6 and ⅝ inches and 10 frames that measure 6 and ¼ inches. Every frame has a plastic foundation that is covered with beeswax. The complete kit measures 19 and ⅞ inches in length, 16 and ¼ inches in width and 6 and ⅝ inches in height. The components are made from quality pine wood and the product is manufactured in the USA. Every dimension is standard so if the need arises you can later buy other frames without fearing that they will not fit inside the honey super. After purchasing it, the customers were pleased by its quality and claimed that it lasted for several years before any repairing work had to be done or any components replaced. This kit has a good price to value ratio and the shipping services are swift and on point. The foundations are covered in natural yellow wax, which encourages the bees to draw the comb on them without any delay. The product design is simple, yet effective as it manages to hold a large quantity of honey and of bees without requiring complicated maintenance. All the components are built to standard. Therefore they are easy to replace and the frames will fit any uncapper when the time comes to harvest the honey. The manufacturer offers a good price to value ratio on this model and it’s a good choice to acquire even if you are on a budget. Some bees do not draw combs on these frames that have plastic foundations only coated with wax. By buying this product you take a risk. Although the exterior is painted, it could use another layer of paint as the applied one is rather thin and may not protect the pine wood so well. The Little Giant Farm hive body can accommodate 10 frames. It comes pre-assembled and it’s easy to set up in your garden. The foundation is made from wax coated black plastic. The unit can be used both as a brood box as well as a honey super. The product is made from unfinished pine wood. As soon as you get this item out of the box you can add it to hive immediately. The deep hive body is fit for 10 frames and measures 9.5 inches. There are also 10 wooden frames included in the package that measure 9.125 inches each. All the wood components are precision-milled. It’s worth mentioning that this kit does not come with a top cover. This is because the box is designed to be placed at the bottom, on the ground or on a stand, and you will place other boxes on top of it later. This model features a deeper beehive box, hence the name “Giant”. This will translate in a larger honey harvest and a larger bee colony. The pinewood is correctly cut so that it fits properly at the corners of the beehive box. The surfaces are smooth and prevent splinters from hurting you. Both the beehive box as well as the frames all pre-assembled. You don’t have to read manuals and spend the time to assemble every part. For added support, there are metal runners in the places where the wooden frames hang. This further enhances the product’s durability. Some boxes arrived at the customers with cracked side panels. They complained that this should not have been the case taking into consideration the paid price. The hive box is not painted, so if you use it as is, it will not resist for a long time in bad weather. You should give it at least one layer of paint. This product contains 10 precision-cut already assembled wooden frames designed for beehive boxes. These commercial frames feature foundations coated in RiteCell wax. This attracts the bees and encourages them to draw their combs on these frames. The frames’ dimensions are standard and fit in any other bee hive box and go through any uncapper. It is worth mentioning that although the foundations are covered with wax, they are made from plastic and this is not as appealing to bees as pure natural wax would be. This may lead to them drawing their combs after a longer period of time or not at all in some cases. The frames are made from pine wood and don’t contain any knots. This enhances their structural durability and overall appeal. Their sizes are standard and will fit any Langstroth type beehive boxes. The frames are made after standard dimensions so they are compatible with any other beehive boxes you may already own. There is no flexing in the frames. Both the woodenware and the wax-coated plastic foundation are sturdy components. The frames save you a lot of time. You have the option of building them yourself if you buy the separate materials, but this product is easy and ready to use as soon as you receive it. These products are a must around your beehives. You never know when you need to replace a broken frame so having some frames at your disposal saves you a lot of trouble. During transportation, there is the possibility that the foundations may come out of their frames. As they can’t be fitted back inside, the frames are useless. As the core of the foundation is made of synthetic material, it will take some time for the bees to draw out the comb. This kit contains a pre-assembled honey beehive box that can accommodate the 10 frames that are also included in the package. Both the beehive box as well as the frames are made out of quality pine wood that has been cut with precision and joined together. Moreover, for added structural strength, every box is stapled. The frames feature a synthetic foundation board that has been coated in natural RiteCell yellow beeswax. This will be the base upon which the bees will draw their combs. The box and the frames are built according to standard Langstroth measurements. Therefore they are compatible with most products you may already own. The hive body measures 9 and ⅝ inches and every frame is 9 and ⅛ inches deep. It is worth mentioning that in order to begin your craft as a beekeeper you still need a bottom board and a top cover. The structural resistance of this product is improved as it uses staples to join the box side-panels. This will prolong the item’s durability. Both the frames and the box are built after Langstroth standard dimensions. This means that you can use these components in any other hives as long as they are built to standard as well. All the parts in the package are pre-assembled and do not need any additional construction. They are ready to be used just as you take them out of the box. The components’ manufacturing is of high quality. The wooden joints are sturdy and the surfaces are smooth. This product does not come with a lid or with a bottom board. All you get are the box and the 10 frames. You have to buy everything else separately. The wood out of which the box is made is not painted, not even on the exterior surfaces. To ensure protection against rot, you have to apply a couple of paint layers. This product is designed to accommodate Mason bees during multiple seasons. It includes a wooden box and tubes made out of paper that have the ideal dimensions for mason bee females to lay their eggs from spring to autumn. The larvae develop during the winter and leave the tubes in the following spring as adult bees. The Mason bee pollinates up to 10 times more than regular honey bees. They are unable to dig their own holes, so they do not pose a threat for any woodwork. This is why they need these bee houses in order to reproduce and develop. Moreover, they require little to no maintenance. Their tubes just need to be changed only once every 2 seasons to prevent parasites. Apart from that, they manage on their own. During winter they can be moved in a shed for protection. However, they must remain in a cold environment to trigger the dormancy process. This is a cheap, easy, alternative way to perform traditional beekeeping. The maintenance required is minimal and their presence will make the surrounding vegetation flourish. The wooden box surrounding the paper cylinders is high quality and durable. It can withstand harsh weather even during winter. All the straws come preloaded in the wooden box so you don’t have to do anything else but to place it wherever you want. The straws are made of cardboard which is preferable to plastic or bamboo. The two last mentioned materials are difficult to remove and they will retain parasites that harm the bees. The design has a major inconvenience: it doesn’t provide a way of hanging the bee house or mount it. You have to place it on the ground or on something. This bee house offers good value for its price, especially since the tubes are not made from bamboo and are made from cardboard. As there are many types of beehives, you have to know the main features, the pros and the cons of each one before acquiring it. Here are some details about what kind of beehives you can acquire and some factors to consider when buying something like that. This model was invented in 1851 and, according to bee hive box reviews, is amongst the most popular one today. One of the main advantages of this hive is its expandability. By stacking more boxes one on top of another, you can enlarge your bee colony and in consequence get more honey. These hives are known to hold large quantities of honey and their design prevents the bees from being harmed during harvesting. Their size and shape are standard and components can be bought separately if needed. On the downside, they can get a little heavy, especially when multiple boxes are connected and this model implies an invasive beehive inspection. Sometimes known as TBH, this model is designed in the shape of a long box and has many top bars. The hive is covered by a roof that protects the bees both from the weather and from predators as well. Unlike the Langstroth type, TBH doesn’t have a foundation or frames. From the top of each bar, the bees form a comb. This hive is light and it can be placed at any desired height. This means that people with disabilities can easily work with it. It costs less than the Langstroth model and the inspection is less invasive. It’s worth taking into consideration that THB can’t hold as much honey and it doesn’t have the adequate ventilation due to the closely knitted bars. This model is similar to the Langstroth version because it can be expanded by adding new boxes. The difference is that the new boxes are added beneath rather than on top. The quilt box that serves as a roof also absorbs generated condensation. Because the entrance to this hive is already narrow, you do not need an entrance reducer. This model requires minimal inspection and the insulating box helps you manage the temperature and aesthetically the hive looks good outdoors. Unfortunately, this model is more expensive than the others and you would need another person to help you when you are inspecting the hive because the top boxes must be lifted first. This model is relatively a new one as it was launched in 2015. This model design doesn’t require it to be opened in order to harvest the honey or to inspect the bees. Small glass panels placed on its sides allow you to watch the bees inside and a lever can be turned to extract the honey. Although the bees are not disturbed and the amount of labor is minimal, this hive is expensive and has a complicated design which is difficult to understand, especially by a beginner. Moreover, as the bees prefer wax, they may reject plastic frames. As the name implies these hives come in a hexagonal shape. The boxes are made of cedar that prevents mold from growing and have a rough texture. This design is pleasing to the eye and the hives come already fully assembled. Moreover, you don’t need an entrance reducer. On the downside, this hive costs more than a Langstroth model. Also, because the exterior frames are not removable, the bees can’t be inspected. This poses a risk in regard to pest infestation. If you plan to buy one of the best bee hive boxes, you have to take into account how much money are you willing to pay. Depending on the model you wish to acquire, a new bee hive box ranges between $100 and $300, so set your budget accordingly. Be prepared to expand your hive at a certain point. Some beehive models can be modified and customized by adding secondary frames, boards, pollen trappers, etc. If you are a beginner, you should first buy a standard beehive. This way you will learn the basics and get comfortable with the usual tasks performed around a beehive. After that, you can acquire more complex beehives and customize them according to your needs. Think if there is any supply of food and water in the area available for your bees. The hive will thrive if they have plenty of fresh water and nectar. Therefore, if you want to produce honey you will have to place your hive boxes in a favorable environment. Try to set up your hives in a place relatively remote, where people and animal activity is minimal. This will keep the bees calm and it’s less likely they’ll become aggressive. Place the hives in open space. Last but not least, do your homework regarding local regulations before you buy bee hive boxes. You have to comply with your local rules regarding beekeeping if you plan on going down this path.